Less than a year ago, EA told PC gamers it would give them something that many PC gamers probably thought they didn't need: a competitor to Steam. Another PC storefront for downloading games. Another PC service for connecting PC gamers. Another thing to install and… wait, where'd the EA games go on Steam? EA's service is called Origin. It's been notorious. But now EA can tell you that it's popular. And the man who has most championed it, the company's chief operating officer and number two exec, Peter Moore, tells Kotaku that after a rocky launch and major customer skepticism, he's sure EA will get Origin right. But Valve boss Gabe Newell made sure his crew kept improving it. "They provided, over the years—to Gabe and the team's credit—value to the gamer. Those first 12 months were very rocky." Origin is less than a year old. 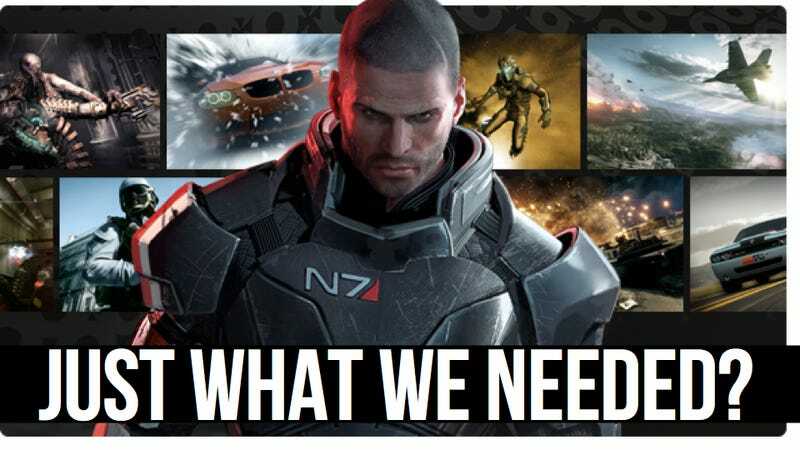 It's mandatory to play Battlefield 3 and encouraged for Star Wars: The Old Republic. Four out of 10 players of The Old Republic use it. Origin lets you chat with friends but has no message boards. It mostly just sells games. It's got 9.5 million registered users, as of last week, who have spent some $100 million on in-store transactions. "We felt the PC business was having a little bit of a renaissance," Moore told me, "and we felt great opportunity with both Star Wars and Battlefield. Mass Effect to come. That this was the time to build out a true platform." Moore says Origin will help EA improve its connection to PC gamers as EA, in general, takes a more active role in selling stuff directly to gamers at the right price and frequency in the right way (i.e. the kind of access they wish they had to console gamers but don't because Sony, Microsoft and Nintendo are in their way). Getting close to gamers has its downside, and that is what has been freaking some gamers out who see Origin as a way to get way too close to a gamer's life. This is big-conglomerate EA we're talking about. (As opposed to big-conglomerate Sony or Microsoft, EA might say; but the comparison is still, for consumers, to the cozier Valve). "We need to continue to add social layers so there is value to the consumer," Moore said, "so it doesn't feel like, in their words, 'something that is mandatory that I don't want.' And it got off to a rocky start for all the wrong reasons which were mostly inaccurate: accusations of spyware. The EULA… We were clearly focused on by some folks who said, 'We don't like this. How can we start picking things apart?'" All criticisms of a new thing can't be invalid. They can't all be coming from anti-EA axe-grinders, and Moore knows this. He also believes that Origin is already past the worst criticism it's going to get. "It's quieted down," he said. "I don't think you see the initial level of vitriol. And I've been in gaming long enough [that I know that] if you try to add something that's different and particularly if you add the layer that it's EA and everything that goes with it." It didn't help EA's goodwill that they named their Steam competitor after a beloved old game development studio that the company bought and then shut down, I pointed out to Moore. He said Origin's name was not meant to refer to the old Ultima creators at Origins Systems. "I'm in Silicon Valley and the [new product] names have become unpronounceable because they've run out of real names," he said. "I felt it was a great name. We knew we could protect it, which in the world we live in, is job one." EA's latest push on Origin is to add more games from third-party publishers. They're up to 21 of them, including THQ, Warner Brothers Interactive Entertainment and Capcom. It's unlikely that EA rival Activision will ever show up there. But what about Valve? "It's an open platform," Moore replied. "There is nothing I would love more than to have Valve's… everybody's games. We're talking to every publisher, as you can imagine. "I think it's healthy for the industry to have more opportunities to go, if you will, to shop around, to find different things that you like, different content. The more stores there are for me in the mall, the more entertaining it is. Sometimes my wife will drag me to a little boutique mall that's got like eight stores. [groans] I like the gamut. I like choice." For Origin to be a choice that gamers don't resent it will have to be more than mandatory or heavily-promoted. It will have to be a great service that offers obvious value. Steam currently does that. Moore knows Origin needs to step it up. "It's one of those things where I would ask: give us 18 months to two years. And if we sit here two years from now, start looking at it then," he said. "I think the ability to have your own direct platform with the consumer is going to be very important in the digital world going forward."